Today's beautiful bride, former Miss Indonesia 2012 Inesh Putri knew that she wanted an intimate wedding without forgetting her Balinese tradition. Along with her fiancé, Adrian, the pair planned two laid-back celebrations in Bali during which they could engage with their loved ones comfortably. Bohemian was selected as their wedding theme and we couldn't think of a better choice for this chill, relaxed couple. The wedding was held at The Shaba, a luxurious function house and hotel at Jimbaran, and around 150 guests were invited to witness this couple's union. 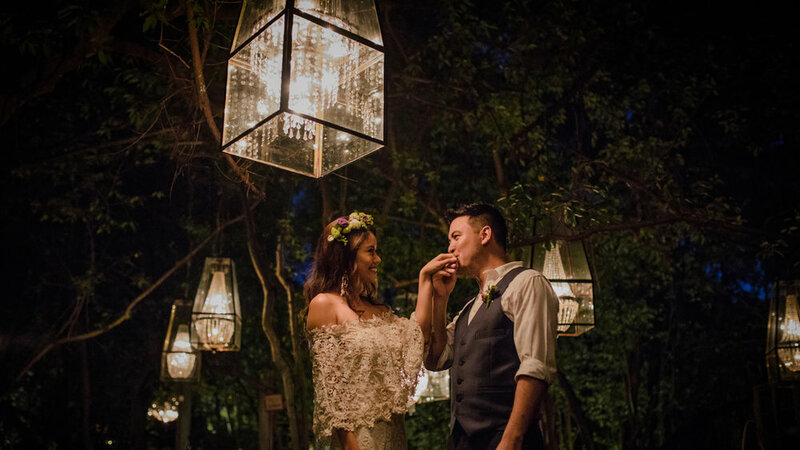 The celebration took place in both indoor and outdoor setting, completed with breathtaking Boho details. The bohemian touch apparently didn't end at the decorations. With a little DIY, the bride turned her dream wedding dress into reality. A bohemian, off-shoulder lace piece in mermaid silhouette looked ethereal on her as it flattered her figure perfectly. "Everything was so beautiful. The venue, the bohemian decorations, the food, it was just lovely. We even had time to do a short photo-session before everything starts. It was a fun and loving moment for all of us," said Jessica of Valerian Photo. Following the successful intimate celebration was the traditional Balinese blessing ritual that was held at their private home in Kuta. Inesh looked mesmerizing in a purple Balinese kebaya and just like the previous festivity, every element of this day was kept simple. The photographer reminisced how the wedding was a dream for her to document, "To be able to document a wedding of mixed traditions is a dream of mine. I'm truly grateful and happy for their marriage". With a couple as such, it didn't surprise us that the photos turned out to be beautiful. Both Inesh and Adrian conveyed raw emotions freely, scroll through the shots one more time to see for yourself.